In the Butterfly Jungles experience, visitors are able to walk amongst stunning, free-flying butterflies from around the world in a rainforest environment full to the brim with beautiful exotic flowers. All stages of the butterfly’s incredible life cycle can be observed at first hand including egg laying, fascinating caterpillars and incredible pupae from which visitors will be able to see the adult butterflies hatch and dry their wings. 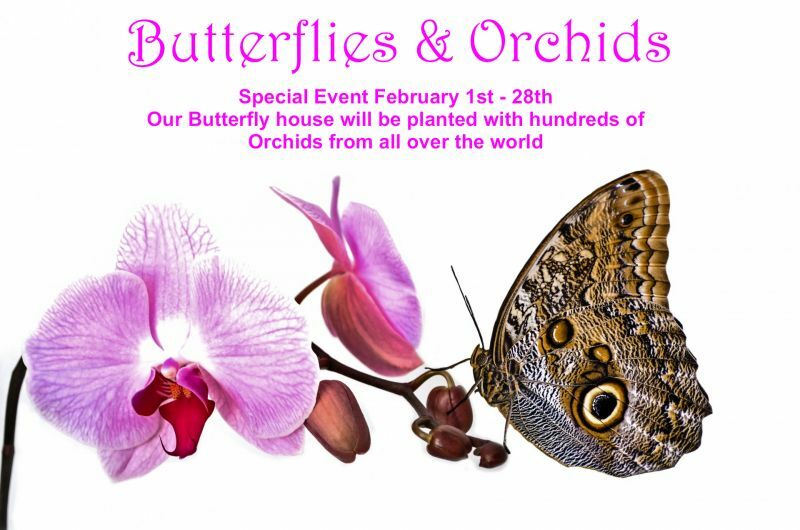 There are also feeding stations where visitors can observe fruit feeding species and a butterfly expert will also be on hand to answer questions and explain the fascinating process. £4 for adults and £3 for children. The plant shop will be closed from 1st October 2018 reopening on the 1st February 2019. With all manner of butterfly goodies on sale including the ever-popular Butterfly Kits, which allow you to rear your own butterflies and release them into the garden. The plant centre also offers a range of butterfly attracting plants, shrubs and wild flowers and the tropical plant section sells rare and exotics plants suitable for the greenhouse and conservatory.